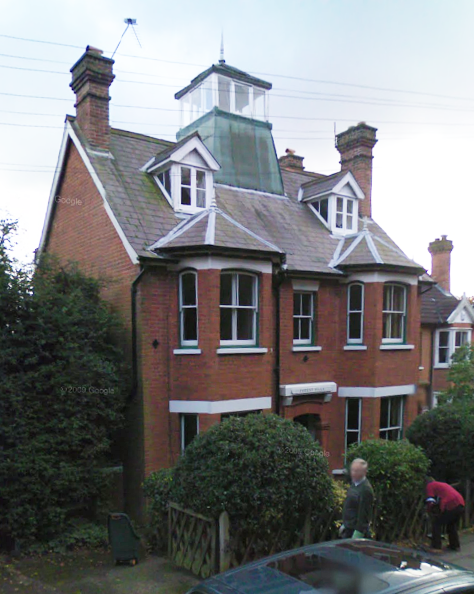 We can’t see the blue plaque, but thanks to Google Earth we’re able to see the house that lexicographer, missionary, and amateur astronomer Robert Hunter built for himself on Staples Road, Loughton, Essex in 1882. It faces Epping Forest, and the garden looks down the Roding valley. 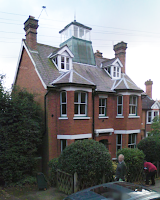 ‘7 Forest Villa was built (as Forest Retreat) by George Beckett in 1882 to the specifications of Dr Robert Hunter who was a Scottish missionary and lexicographer. Hunter compiled most of his 14 volume Encyclopaedic Dictionary (1879–1897) and his Bible Dictionary (1893) in the house. The former being the biggest before the Oxford English Dictionary was released. Hunter used the house not only as his residence, but as a place of refuge for sick children from the Victoria Docks. He died in the house on 25th February 1897. There is now a blue plaque is visible on the house. 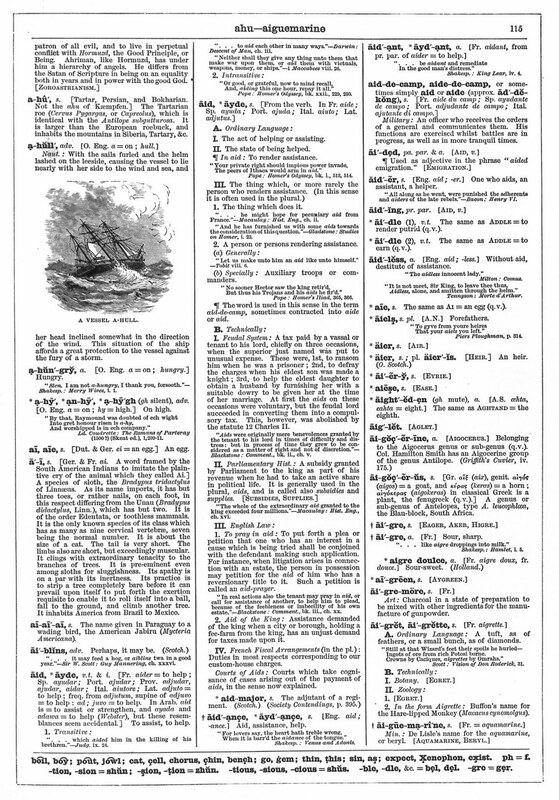 The earliest use of bold headwords in a major English dictionary appears to be Robert Hunter’s The Encyclopædic Dictionary (originally pubished by Cassell, later published by Edward Lloyd) which appeared in parts from 1879. Hunter’s page is a remarkable precursor of Murray’s OED layout: bold lower case is used for headwords, senses are divided using a ‘branching’ numbering system, and each sense within the hierarchy begins a new paragraph. The Encyclopædic Dictionary is generous in its use of space: a hanging indent is used for headwords, numbered sense paragraphs begin with a further indent, and a half-line space separates each entry. The clarity of the innovative all-lower-case bold headwords is compromised by the addition of light en-rules to indicate syllabification and diacritics to indicate pronunciation. The headline shows the first and last new headwords on the page, separated by an em-rule. Bold is used for the major sense-division indicators, and subtle semi-bold numerals are used for numbered senses. Overall the use of metalanguage is systematic and analytical. Italic is used consistently for register, subject field, and grammatical labels (slang, Naut., Transitive). Register and subject-field labels introduce the relevant sense, rather than being part of the wording. Illustrative quotations are set in the conventional broken-off style, but this disrupts the page minimally, as there is already considerable vertical fracturing of each entry. Hunter’s division of senses, however, has none of the rigour or economy of Murray and certainly lacks the simplicity of Johnson: entries disintegrate into columns of paragraphs numbered with finer and finer grades of senses (‘Each word has been sub-divided as far as possible into the various meanings which it assumes at different times.’ – Preface, p. ii). Phrasal verbs, though displayed in full, are particularly difficult to locate, as italics rather than bold are used for these. It is easy for readers to lose track of the hierarchy of sense-divisions in a long entry.